With Phil, Shonny and a driver we will circumnavigate the stunning island of Tasmania. With around 1,500km in 9 days, we'll take you to some of the worlds most remote and breath taking wilderness trails as well as world class flow! 7 days and nights of Tasmanian Mountain Bike Awesomeness! Ride breathtaking and well-crafted trails on Mount Wellington, Meehan Range, Maydena Bike Park, Maria Island, Blue Derby and Blue Tiers. Contact us to discuss available dates. 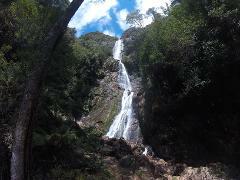 A taste of Tassie's best MTB! 1 day in Hobart, 1 day at Maydena Bike Park and 3 days in Derby. 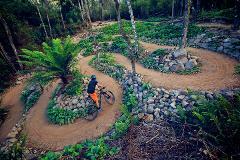 5 Days of Tasmanian mountain bike awesomeness and unlimited shuttles in Derby! Contact us to arrange available dates. 3 days + 2 nights of Tasmanian mountain bike goodness! First day we hit the best of Hobart's trails. The next two days, we're in gravity mode, hitting the awesome trails at Maydena Bike Park. Contact us to arrange available dates. 3 days and 2 nights spent exploring Tasmania’s wonderful West Coast! You will ride through amazing rainforests, past the most wonderous waterfall, rugged mountain ranges, stunning isolated coastline, beaches and other hidden treasures. This Weekender Tour is 2 days and 2 nights of Tasmanian Mountain Bike Awesomeness! Ride breathtaking and well-crafted trails on Mount Wellington, Meehan Range, South Hobart’s, Maydena. Contact us to discuss availability of dates. Come with us and explore this magical island. Get up close with the wildlife and be mesmerized by the landscapes. You'll have an expert guide + option for bike hire. Only a moderate level of fitness is required to participate in this tour. Arguably the best easy ride around Hobart. 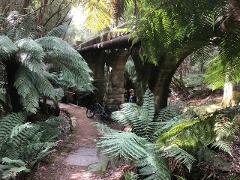 This beautiful 12 km forest ride gradually decends on firm, wide and traffic-free trails, until rolling into South Hobart. A delightful 2 1/2 - 3 hour cruise through foothills of Mt Wellington.